It's official. I am in love :)) If I was in high school I would be drawing little hearts all over my notebook! It's my hubby's fault he introduced us, and brought it home for me. My go to board is great. Her name is Betty and we have been together for about 5 years. I have a feeling Betty is going to be very jealous and will not be happy being cooped up in the surf shed this winter. My biggest dilemma now is what to name my new board?? She needs a good purply swirly name. So I am having a mini giveaway!! Help me name my new board and I will giveaway 2 items from my TpT or Teacher's notebook store. Before I go just a quick announcement. I just opened up a clip art shop over at Teacher's Notebook. I love making all those digital papers, but my TpT shop is getting too cluttered so I am going to just add new papers, frames and clip art to the Teacher's Notebook shop:) I would love it if you stopped by to check it out. She's so pretty! She looks a lot like cotton candy to me... so I think you should call her Candy! Is that too white trashy? Lol! Oooh, she does look like cotton candy!! I'm diggin' Candy. And, Corinna - you are too cute! Marble! It looks like the pretty swirly marbles. Ohhhh, it is so pretty. I was thinking Indie (because that is the name my kids didn't name my grand daughter and I like it, lol) OR Twila (short for Twilight - the time of day that the sky is purple and the water is warm) OR Rose OR Dawn (the early morning light when the water is still) Have fun with her. or Pearl - since you live on Oahu and she has that pearly, swirly color. How about Lola or Dream Rider? Tie-dye looking makes me think of peace, so I looked up the Hawaiian name for peace which it says maluhia. Lavender, Violet, Lydia, Maeve and Vy. All are names associated with purple. That is one beautiful board! Such wonderful names. I was also going to suggest Violet and to call her Vi (long i) for a nick name but I do love Twila/ Twilight option cause of the meaning. I also REALLY love Victoria/ Vicki. How about Betty-too or Betty-two? 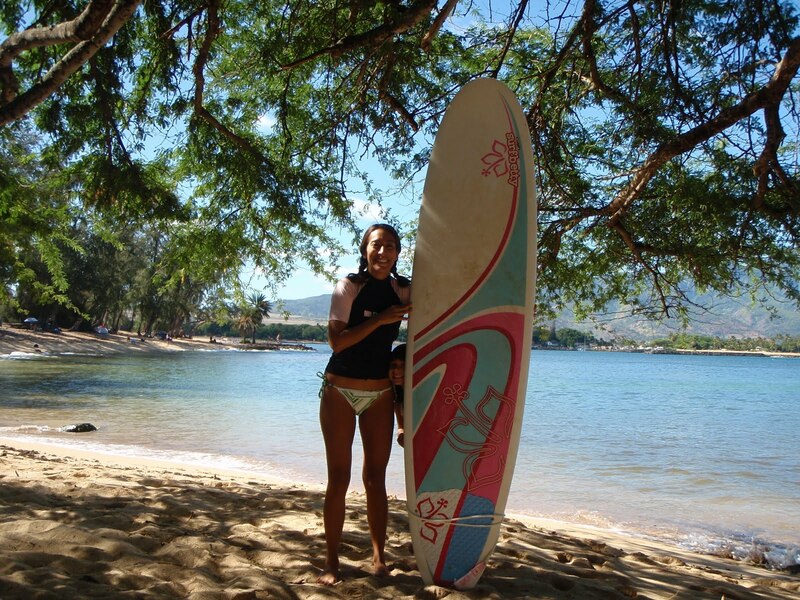 Love the board and the sunny beach pictures!! How about Bubbalicious? The board reminds me of the purple grape bubble gum I used to love to get as a little girl. By the way.. I love those holiday papers! Oooh I like Bubbalicious! It sounds so grapey, I can almost taste it! so many cute names have already been posted so i had to wrack my brain. hows about orchid??? I love all of the names posted!! I would name her Lily - it means purity and beauty. She is beautiful and the ocean seems like pure beauty. I like your new board and love your blog! I am also completely jealous that you live in Hawaii - I have been there once and it is a great place! I don't have any too fabulous name choices - I like the ones everyone else has posted more than mine. I like Marie's idea since Betty might be a little put out! Of course the name I picked out is completely self centered!! It is Heather. Heather are small purple flowers and my favorite for obvious reasons. Congrats on the new board! I love all your great ideas. Thank you for sharing it.